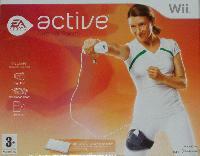 Leg strap to hold the Wii nunchuk to your thigh during some exercises. Resistance band. This is a long stretchy length of material with handles. You stand on the middle and then pull on the handles to work your arm muscles. Story: Your kids are getting older so that you don't have to spend your entire time running round after them anymore. You're getting more sleep and you don't have to push a buggy everywhere you go. There is no more wrestling over nappies. Nonetheless, you're still eating just as many chocolate biscuits as when you were chasing toddlers 24/7. Your trousers no longer fit. Something has to be done before you're forced to go and buy new clothes! Gameplay: This isn't a game really - it's an interactive workout video. There are dozens of exercises arranged to form numerous half-hour routines aimed at increasing your fitness and building muscle-tone in different areas of your body. The exercises include basic things like squats, running on the spot and bicep curls but there are also some sport and dance minigames. A few of these can be enhanced using the Wii Balance Board but it's by no means essential. The Wii tracks your movements as you perform the exercises to make sure you're doing them right and a trainer offers constant feedback. There's a '30-Day Challenge' involving a prescribed series of 20 workouts to be done over a month. There are also various one-off workouts and options to customise your own. Three levels of exertion can be selected. Save System: Your achievements are automatically saved after each workout. Comments: I think it's finally time to admit that I need to do a bit more exercise. I can no longer say with complete honesty that looking after the kids is enough in itself to keep me in shape. There just isn't as much physical activity as there used to be. My years of toddler hefting and buggy racing are gone. Any day now, I'm going to wake up fat and bald. Active can't do much for my imminent hair loss but it has got me burning calories regularly. Switching on the Wii is much less time-consuming than a trek to the gym and has the added bonus that I don't have to leave the house in the rain. It's simply much more likely to happen. While Wii Fit is about balance and well-being, Active is about heart-pumping sweatiness. All pretence of being a game is dropped in favour of increasing the amount of exercise involved. As such, it's not gripping entertainment but the real-time estimate of calories burned and the constant changes of activity are enough to maintain attention. After a while, it's a case of focusing on keeping breathing anyway. The very enthusiastic woman offering constant praise and encouragement is embarrassing if anyone else can hear but it's actually rather pleasant and motivating getting such positive feedback. You'll want to turn the music off and switch on your own MP3 player before long, though. Each exercise routine takes around half an hour once you've got the hang of things but the first few take much longer thanks to the need to watch the instruction videos for each activity. It also takes time to get to grips with the equipment. The strap works best with leggings and has a tendency to slip down unless done up very tight. The giant elastic band is a little limp and needs to be folded over for some exercises. Swapping between activities while changing accessories and juggling the wiimote and nunchuk requires practice to do efficiently. 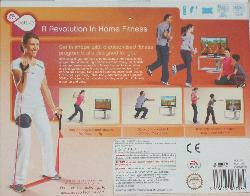 Fortunately, the Wii waits until you're ready and then monitors your movements, so the routines stick to your pace. I'm looking into getting a wireless nunchuk, however, because the wire can be restrictive in a few of the activities and I keep whipping myself in others. The main issue with Active (apart from getting sweaty) is that you'll need somewhere suitable to play it. Some of the exercises require plenty of space and/or a ceiling high enough to reach straight up without destroying a light fitting. Worse, such things as running on the spot and side-to-side jumping make the floor shake. Exercises can be easily removed from the supplied routines but, even then, if you live in a flat, you're going to have to make sure the downstairs neighbours are out. The use of the Wii Balance Board is fairly cursory. That said, it's still nice to get a little more service out of the thing. All in all, Active is surprisingly good. As with any exercise regime, it requires perseverance to get results but it's a great way to work your whole body without having to go outside in the cold and rain and without filling your house with expensive equipment. Conclusion: Brings the gym to your living room (minus the monthly fees and scary blokes called Sven). Graphics: It's all pleasantly bright and sunny. Length: Depends on your willpower. YES. This is exactly the kind of thing I need. An exercise program for a computer geek like me. I am absolutely going to try this. Good luck with the muscle toning. As a bonus, the game's nice and sunny to help get you through the cold winter.